The rookie-level Gulf Coast League Cardinals were unable to repeat as league champions, missing the playoffs entirely. Hitting was improved, but pitching and defense backslid compared to 2016. The rookie-level Gulf Coast League is the lowest rung of the seven levels in the St. Louis Cardinals system in the United States. The reality that the club plays on the back fields of the Cardinals complex in Jupiter, Florida in front of basically no fans, means information from the GCL is delivered mostly from box scores. However, the Cardinal Nation again has a local reporter, Paul Ivice, attending most home games, providing an insiders perspective that is available nowhere else. His insights provide the core of this article. The club always features an interesting cross-section of players – from non-drafted collegians to high school stars to first-time US players from the Dominican Republic academy, a few top draft picks thrown in, and now and then, even more experienced players on rehab assignments to complete the mix. The 2017 edition of the Cardinals was unable to continue the regular-season success the club has enjoyed in recent years. Led by manager Steve Turco, then interim manager Erick Almonte, the club played .473 baseball, winning 26 and losing 29. The Cards were successful at home (16-11), but struggled badly on the road (10-18). The Cardinals finished the season in fourth place, 7.5 games behind the Nationals. It was a far cry from the 2016, when the Cardinals posted a .611 winning mark, going 33-21 and winning the five-team East Division by 2.5 games. It was their fourth division crown in the prior five years. They went on to take the GCL title. The GCL is a short-season league. The 56-game regular-season schedule began on June 26 and concluded on September 2. The 17-team league is made up of three four-team divisions, plus the Cardinals’ East Division, which has five clubs. To ease travel, each team played exclusively in its division. That meant the Cards’ schedule included 14 games each against the Astros, Marlins, Mets and Nationals. In the five-team division, clubs played four games with the fifth day off. The Cardinals got out of the gates poorly, losing all four in June. The offense scored 11 runs, but the pitching yielded 26. However, as the calendar flipped to July, the club hit what may have been its high point, opening the month with five straight wins. After essentially alternating losses and wins for a week, the Cards again reeled off five more victories in a row. At that point, on July 19, the club was a promising 12-8. That momentum evaporated almost immediately, however, as the Cards reeled to a 2-10 record over the remainder of July. That included a six-game losing skid. The 14-14 month meant an overall record of 14-18. August was almost a carbon copy of July. The new month began with four straight wins, as they reached .500 once again. From the 12th through the 15th, the Cardinals took five consecutive victories, with a 10-2 start to August. However, the second half of the month was again a disaster. The Cards dropped 10 straight, while dodging rainouts and postponements. Winning three of the last four was a case of too little, too late. Looking at the big picture, the Cardinals’ decade spent in the GCL can be viewed as two clear groups. In the first four years, the Cards never logged a winning record. However, since 2010, they finished above .500 five of seven years, including four division titles. Until finally breaking through in 2016, the Cardinals were partially stymied by GCL rules that continue to give division winners just one game in the semi-finals. Last season, the Cards again took the East Division, then finally won the one-game first round of the playoffs, after dropping all three prior chances – in 2012, 2014 and 2015, before going on to win their first league title. However, their 2017 winning mark of .473 is the second-worst for a Cardinals team since 2009 and their fourth place finish in the standings is the lowest since 2008. Following are the GCL Cardinals records by year. OK, so we know the Cardinals had a down season in 2017, but why might that be? Paul Ivice weighs in, suggesting the difference is the level of talent. Coming off their first league championship in 2016, and fourth division crown in five years, the GCL Cardinals had few things go right in their attempt to repeat. 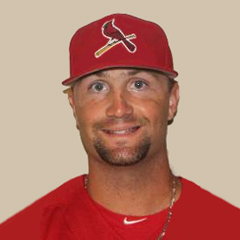 The last Cardinals’ top draft pick who did NOT begin his pro career with the GCL team was Kolten Wong in 2011, and even then, four of the next five 2011 picks were assigned to the GCL. This year, the Cardinals did not even have a pick until the third round, and sent their top three picks – and 15 of their first 19 selections – to higher-level leagues. Catcher Zach Jackson, the sixth-round pick out of Winter Haven, Florida, was 4-for-41 (.098) with 10 walks but 20 strikeouts in 41 at-bats over 14 games, but did not play after July 30 due to a sore back. Right-handed pitcher Wilberto Rivera, the eighth-round pick from the Carlos Beltran Baseball Academy in Puerto Rico, made only nine appearances, all in the last five weeks of the season. Rivera posted a 5.79 ERA in 9-1/3 innings, allowing 12 hits and six walks while fanning eight. 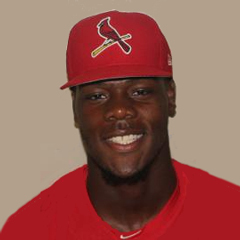 Infielder/outfielder Donivan Williams, the 14th-round pick out of Oak Lawn, Illinois, in west suburban Chicago, had a .204 batting average and .581 OPS with one home run and 16 RBI in 33 games. Drafted as a third baseman, Williams could get in only eight games there because of the presence of Elehuris Montero, but showed some versatility by playing 14 errorless games as a corner outfielder and even two games at second base. Outfielder Terry Fuller, the 15th-round pick from Griffin, Georgia, got the most playing time among the high school draftees, with 37 games, including 18 in left field and 18 in center. The lefty-swinging Fuller struggled most of the season against pitchers of both persuasions, finishing with a .161 average and .522 OPS. If there is one stat that bodes well for Fuller’s future, it is that he was 5-for-14 (.357) with two home runs and five RBI in late-and-close situations, including a game-winning home run in his final at-bat of the season. So, overall it was at best an average year talent-wise for the GCL team. Nevertheless, there were some very good performers who earned some high marks. There is even more than the rounds of the 2017 draft to consider. Despite the influx of high schoolers, in aggregate, the GCL Cards were older than most of their competition. Of the 17 teams in the league, the Cardinals pitchers averaged second oldest with the hitters also tied for second-oldest. Specifically, the Cards hurlers were 19.7 years of age compared to the league average of 19.4. The position players averaged 21.3 years of age, almost an entire year older than the GCL average of 20.4. As an organization, the Cardinals are traditionally known for their pitching, but the 2017 results did not bear this out. Their 3.97 team ERA was in the lower half of the league (ranked 11th) and was over three-quarters of a run worse than the 2016 club, which finished sixth in the league in ERA at 3.16. It is worth noting that while there were big names on last year’s team from the 2016 draft, the reality is that they did not throw many innings. Working under a closely-monitored pitching plan were Dakota Hudson, Connor Jones and Zac Gallen, who combined for less than two games total – just 17 2/3 innings pitched. Further, all three were gone by the post-season with the former two having been promoted and Gallen excused to return to college. 15 different pitchers started for the GCL Cardinals in 2017, including rehabbers Sean Gilmartin (Memphis – 5), Zach Duke (2), Derian Gonzalez (Palm Beach – 2) and Arturo Reyes (Springfield -1). The 2017 pitching staff, tutored by second-year GCL coach Giovanni Carrera, logged the aforementioned aggregate ERA of 3.97, which was more than a three-quarters of a run worse than the 2016 club’s 3.16 mark. The league-average ERA in 2017 was 3.78. As is typical across the system, the Cardinals pitchers strike out relatively few, but also limit free passes better than most. The Cards’ strikeout total of 398 was 14th in the league, down from 421 and eighth last year. The Cards issued the second-fewest walks in the circuit with just 144, down from 181 the year before. Their strikeout to walk ratio of 2.76 was third-best in the circuit. With 29 hit by pitches, the Cardinals tied for second-fewest after the lowest total in the league with 27 in 2016. On the down side, they were tied for the fourth-most long balls served up at 26. In terms of baserunners, the Cardinals’ WHIP (walks and hits per inning pitched) of 1.44 was fourth-highest in the league, up substantially from 1.34 the year before. The GCL average was 1.36. Under second-year hitting coach Cody Gabella, the Cardinals offense was a top third of the pack group in terms of numbers, with improvement pretty much across the board compared to 2016. The Cardinals were third in runs scored per game at 5.02, up from 4.13 in 2016 but just eighth in batting average at .259. The 2017 offense was sixth in the league in on-base percentage at .340 and fourth in slugging at .370. Their .710 OPS was also in the top tier, second in the GCL and up from .680 from the year before. An ongoing shortfall across the entire system, from St. Louis on down, is baserunning. The GCL Cardinals are no exception. They stole just 32 bases, dead last in the league and down from 36 the year before. Further, their success rate of 65.3 percent was well below the league-average of 70.1. Despite support from instructors like Jose Oquendo and Willie McGee (pictured above), fielding was not a strong suit of the 2017 GCL Cardinals. Their fielding percentage of .961 was the same as 2016, ranking them 10th. The club tied for the 12th-most errors in the league at 75. The miscues were spread among many with no single player having more than six – other than third baseman Elehuris Montero with 10. The catching, a strength in 2016, allowed 21 passed balls during the 2017 season, tied for third-most in the league, after just five last year. However, the catchers threw out 32 percent of baserunners attempting to steal, 22 of 68, third-best in the league, but way down from the 46 percent success rate in 2016. The 33 players on the active initial roster included three 2016 Dominican Summer League hurlers who made their 2017 debuts with Johnson City just before being reassigned to the GCL. They are Angel Rondon, Junior Gonzalez and Enrique Perez. Opening day starter Winston Nicacio was another 2016 DSL graduate, as is pitcher Brian Pirela, a 2016 DSL All-Star. Position player standouts from last summer’s DSL squad include 18-year-old catcher Carlos Soto plus outfielders Jonatan Machado and 2016 DSL Player of the Year Brian Sanchez. For the second year in a row, exactly 20 members of the initial GCL Cards were system returnees, most up from the DSL. GCL repeaters included pitcher Juan Alvarez, infielder Luis Flores and outfielder Sanel Rosendo. In addition, there was a group of brand-new Cardinals, including 11 of the 38 players drafted by the organization this June, four of whom were highlighted above. Later arrivals included 33rd-round infielder Taylor Bryant, whose Cal State-Fullerton club was eliminated in the College World Series, and 35th-rounder Alex Gallegos, a prep pitching standout from Torrance, CA. Thought unsignable by some, Gallegos is recovering from surgery to repair a torn ACL, so will not officially open his professional career until 2018. Other 2017 draftees assigned to the GCL Cards include pitchers Kevin Hamann (22rd), Patrick Dayton (25th), C.J. Saylor (28th), Jim Voyles (38th), Chris Hunt (39th) and shortstop Michael Brdar (36th). 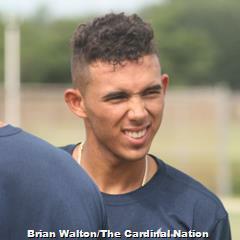 Four non-drafted players are made their Cardinals debut in the GCL. Three are free agent signees – pitcher Gabriel Gentner plus catchers Joe Gomez and Robbie Coman. 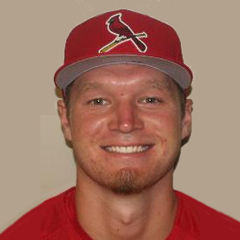 The contract of the fourth, pitcher Austin Warner, was purchased from an independent league club. Warner quickly rose to Peoria while Gomez finished with State College. 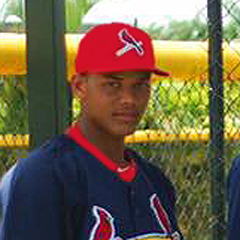 In terms of ages, shortstop Moises Castillo was the youngest GCL Cardinal, celebrating his 18th birthday in July. In total, 10 of the 33 GCL Cardinals were still teenagers. One way to compare the top talent level drop from 2016 to 2017 is to look at prospect rankings. 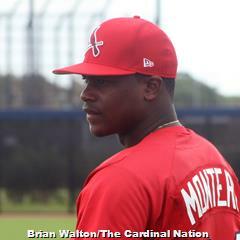 Only three GCL Cardinals appear in the most recent monthly top 50 prospect list compiled by The Cardinal Nation – Machado (23rd) and Williams (50th), with Montero an honorable mention. One year ago, the GCL Cards had eight top 50 members, led by then-third-ranked shortstop Delvin Perez. As many may remember, the latter was temporarily sent back to the GCL from Johnson City for an 11-game refresher before being returned to the Appalachian League in late July. The 2017 Cardinals had two .300 hitters – Bryant at .324 and Machado, one point behind. At .423, Bryant logged the only .400-plus OBP among regulars. Montero led the club in doubles (16), home runs (five), RBI (36) and slugging (.468). Bryant’s .878 OPS topped Montero by 40 points. Machado’s eight steals in 10 attempts made him the clear team leader. The rotation leaders were Nicacio and Rondon, with ERAs at 2.61 and 2.64, respectively. Nicacio paced the club with four wins. Five different relievers shared the team lead with two saves each. Kevin Hamann, at 1.09, led the WHIP derby. Top strikeout pitchers included Kodi Whitley, Cory Malcom and Patrick Dayton, at 11.7, 11.1 and 10.5 Ks per nine innings, respectively. Stingiest with walks was Hamann at 0.9 BBs per nine, followed by Chris Hunt at 1.2. Leading the way in strikeout to walk ratio was Hamann at 8.0, with Malcom at 7.5. 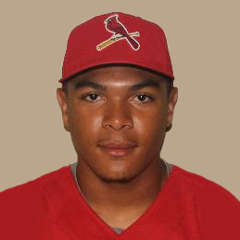 The Cardinals had one representative on the 12-man 2017 GCL All-Star Team, the 19-year old third baseman Montero. As we move into the awards for the top position player, starting pitcher and relief pitcher on the 2017 GCL Cardinals, we will drill down further into individual player stats. As a team, the 2017 Gulf Coast League Cardinals had a good offense but not enough pitching to again win the division. From the development perspective, the club should provide a number of battle-tested players to higher-level organizational clubs in 2018. Link to master article with all 2017 award winners, team recaps and article schedules for the remainder of this series. 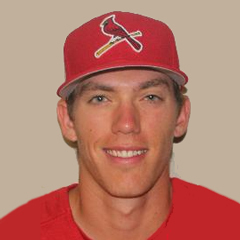 Of course, that will include our selections as the GCL Cardinals Reliever, Starting Pitcher and Player of the Year.